Oxygen inhibition is an age-old problem for coatings that cure via free-radical polymerization. Molecular oxygen can physically quench the triplet state of the photoinitiator/sensitizer, or it can scavenge the free radicals or active radical centers to produce unreactive peroxide radicals. The end results range from reduced coating properties to uncured, liquid surfaces on the coating. This issue is even more pronounced in low-intensity cure processes, such as UV-LED or UVA cure, which frequently result in tacky, uncured surfaces. There are known physical and chemical ways to reduce oxygen inhibition or improve surface cure. This paper will discuss these methods, provide starting point formulations that use the chemical solutions and show the cured coating properties of these formulations. A schematic of UV-initiated free radical polymerization is shown in Figure 1. Photoinitiator is I, double bond containing materials are depicted by R and R’, and AH is a material with easily abstracted hydrogens (chain transfer agent). The photoinitiator absorbs UV energy and generates a carbon-based free radical in the radical formation step. This free radical then initiates the polymer chain through reaction with R. The steps of propagation, chain transfer and termination then occur throughout the process. The molecular weight, molecular weight distribution and polymer composition are determined by the relative ratios of the steps. Figure 2 shows the reactions of oxygen with photoinitiator (PI) and free radicals (R·). In the reaction of oxygen – with the excited state of the photoinitiator – the photoinitiator is quenched and returns to an unexcited, nonreactive state. The end result is fewer free radicals produced by the photoinitiator, with fewer initiated polymer chains and less polymer formation in the coating. When oxygen reacts with a carbon-based free radical, it converts the growing chain to an oxygen-based free radical. This oxygen-based radical is less reactive than the carbon-based radical, and it slows down the free radical polymerization, resulting in lower molecular weight chains. In either case, the reaction with oxygen may give a range of results, from reduced coating properties to uncured, liquid surfaces on the coating. Since oxygen is present at about 21% in air, oxygen inhibition of free radical polymerization is a very real problem in the energy cure industry. Oxygen is present in two places: in the bulk material and at the surface of the coating. Oxygen generally is required in the bulk material to provide storage stability. (In this case, the oxygen inhibition is a welcome attribute.) This bulk oxygen is consumed fairly rapidly upon exposure to UV and has little impact for most coatings. The oxygen at the coating surface is replenished as it is consumed, and it causes most of the issues seen in the industry. Since this oxygen is at the surface of the coating, oxygen inhibition is referred to frequently as a surface cure problem. These solutions have been and are currently used in the industry, but they all have advantages and disadvantages. The use of reactive chemicals is the most commonly implemented solution to mitigate oxygen inhibition. The chemicals that react with peroxy radicals contain easily abstractable hydrogen atoms. These abstractable hydrogen atoms are found in compounds containing sulfur (thiols), nitrogen (amines) or oxygen (ethers). The hydrogens on the carbon atoms alpha to the sulfur, nitrogen or oxygen are those that are easily abstractable, and there are many of these in each molecule. The efficacy of these compounds – for the same equivalency – is thiols > amines > ethers. Improvements in performance are noted when the thiols, amines and polyethers are acrylated. The acrylate functionality ensures that the materials become part of the polymer backbone and cannot migrate or bloom to the surface. A reduction in odor also may be obtained through acrylation. Figure 3 shows the mechanism for the reaction of an amine with oxygen. Since there are six abstractable hydrogens in this amino compound, it can react six times with oxygen. One drawback of the use of thiols is odor; however, improvements in purity have reduced the odor of many thiols. Advantages of using thiols may be improved thermal resistance, reduced moisture absorption and improved adhesion. The use of amines can result in yellowing (either upon cure or after cure), residual odor and moisture sensitivity. The yellowing can be masked or lessened through use of dyes or optical brighteners. Ethers are the least effective solution to oxygen inhibition, but they can be used in large quantities via polyether structures. Many urethane acrylates utilize polyether backbones based on polyethylene oxide, polypropylene oxide or polybutylene oxide. Since large amounts of these polyethers are required, the performance properties of the coating are affected by polyether choice. Diluting acrylates also may be ethoxylated or propoxylated to give reduced oxygen inhibition. The ether groups can cause reduced temperature resistance of coatings and – depending on the type of polyether – reduced water resistance. The polyethers may be used alone or in combination with the thiols or amines to provide further improvements in cure performance. When polyethers are used alone, the deficiencies of the thiols (odor) and amines (yellowing, odor, moisture sensitivity) are absent. The ultimate cure speed of these products is determined by the molecular weight, the acrylate functionality, the type and amount of modification and the type of resin (epoxy acrylate, urethane acrylate, polyester acrylate, etc.). See Table 1 for a summary of the methods to mitigate oxygen inhibition and the advantages and disadvantages of each. In the past, UV-curing systems typically have consisted of one or two medium-pressure mercury bulbs, with broad spectral emissions and with the wattage steadily increasing over the years from 200 to 600 watts per inch. (See Figure 4.) These systems generally were designed to obtain the fastest cure speed possible, with productivity gains the ultimate goal. Today, curing systems are being designed with other goals also in mind. Safety and environmental concerns, cure temperature, energy consumption and maintenance schedules are all influencing the design of these new curing systems. As a result, some of the newer cure systems deliver less energy to the coating and eliminate shorter wavelength UV. Both of these factors tend to increase the impact of oxygen inhibition on UV cure. As mentioned earlier, increasing the irradiance increases the concentration of free radicals, and higher concentrations of free radicals consume more oxygen. Conversely, low energy cure systems with lower irradiance result in lower concentrations of free radicals and more oxygen inhibition. The irradiance should be measured at the substrate – to determine the delivered energy – because delivered energy decreases with distance from the lamp to the substrate. There also is a wavelength dependence on absorption of UV. UV-curable materials exhibit a higher absorbance to short wavelength energy (UVC) than to longer wavelength energy. As a result, short wavelength energy does not penetrate much beyond the surface, and longer wavelength energy (UVB and UVA) survives to penetrate deeper into the material. (See Figure 4 for wavelength nomenclature.) Some of the newer energy cure systems do not emit UVC wavelengths, resulting in increased oxygen inhibition at the surface of the coating. UVA lamps, by definition, primarily emit wavelengths in the UVA range. Most LED lamps emit at 395nm, also in the UVA range. LED lamps with 385nm and 405nm emissions also are used. Lamps with 365nm emission are available but at lower intensity. (See Figure 4). The LED lamps have seen a steady increase in peak irradiance, from 1.1 watts/cm2 to 16 watts/cm2. Improvements in the optics of UV-LEDs also have led to an increase in the irradiance that is delivered to the substrate surface. Better surface cure also can be improved via conventional formulating guidelines and design of cure equipment. Increasing the functionality or double bond concentration of the coating gives a more cross-linked or harder coating. There are certain structures that provide for highly reactive materials3 also. Increasing the viscosity of the coating decreases the oxygen diffusion into the coating and improves the surface cure.1 Thicker coatings suffer less from oxygen inhibition due to the bulk polymerization reaction, which increases viscosity and significantly reduces oxygen diffusion.4 Decreasing the distance from the lamp to the substrate increases the irradiance delivered to the substrate. Increasing the exposure time – via slower cure speeds or multiple lamps – generally increases the extent of cure. These basics can be combined with the oxygen inhibition mitigation techniques to further improve coating performance. Table 2 shows the improvement in surface cure when a thiol (mercapto acrylate) is used at 20% in an LED cure application. (The LED had an emission wavelength of 395nm and a peak irradiance of 8 W/cm2.) With the thiol present, only one pass is needed to obtain a surface that cannot be marred with a fingernail. In the absence of thiol, surface marring is still present after four passes. Better surface cure also is noted when curing the same formulation with standard medium-pressure mercury lamps. Increasing the concentration of the thiol also increases the surface cure. Table 3 shows fast cure speed (greater than 40m/min) when 40 parts of mercapto-modified polyester acrylate is used in a formulation. Using 20 parts of mercapto-modified polyester acrylate and 20 parts of unmodified polyester acrylate reduces the cure speed to 5m/min. Formulations without any mercapto modification do not cure after four passes at 5m/min. Table 4 shows the effect of cure distance on surface cure using a formulation that contains 20% thiol. At small distances, 0.5-1.0cm, only one pass at 5m/min is needed for good surface cure. At 2.0cm distance, two passes at 5m/min are needed to obtain a non-marring surface. The irradiance is decreased at the further cure distance, resulting in less polymerization at the surface and reduced surface properties. Table 8 compares the surface cures of various polyether- and polyester-based urethane acrylates. Thick resin castings of 15mm were exposed for 20 minutes to a 20 watt fluorescent black light (Philips F20T12/BL). Then, they were assessed for surface cure via mar resistance and tack. Only UA 1 – a difunctional polyether based urethane acrylate – exhibited a completely mar-free, non-tacky surface. UA 4 – another polyether based urethane acrylate with 2.3 functionality – was second best. The other polyether-based resin – UA 6 – has a very low Tg and did not perform well in this test. (Mar resistance and surface tack is influenced by the Tg of the polymer.) The polyester-based urethane acrylates did not give mar-free surfaces. Figure 5 provides data on cure time versus content of UA 1 when using a low-intensity UVA lamp. As the concentration of UA 1 is increased, the cure time decreases. The formulation was based on UA 1, propoxylated neopentylglycol diacrylate (NPG(PO)2DA) and photoinitiator. All these data show that polyether modification of urethane acrylates can be used to increase surface cure speed with low energy UV lamps. Table 9 shows the improved cure response of a polyether-based urethane acrylate – UA 1 – as compared to polyester-based urethane acrylates when cured with standard medium-pressure mercury lamps (600 watts/inch). The formulations in Table 9 were prepared to have equal resin (urethane acrylate) content. The surface cure energy is the UV energy required to achieve a mar-free surface, with lower energy indicating greater reactivity. The difunctional UA 1 has the highest reactivity, even when compared to the trifunctional UA 7. These numbers show that polyether modification of urethane acrylates also can increase surface cure speed with high energy UV lamps. Table 10 shows the synergistic effect on surface cure speed of combining polyether-based UA 1 with a thiol (mercapto acrylate). The combination is especially effective at low coating thicknesses. Cure was with a 395nm, 8 W/cm2 UV LED lamp at 1cm distance from substrate. Table 11 shows the reactivity of a bio-based oligomer with inherently fast cure due to structural components. The difunctional bio-based oligomer is more reactive than a six functional urethane acrylate under LED cure conditions. Combining the bio-based oligomer with a thiol (mercapto acrylate) provides even better surface cure (determined by surface marring by fingernail) at both 30μ and 10μ thicknesses, as shown in Table 12. Cure was with a 395nm, 8 W/cm2 UV LED lamp at 1cm distance from substrate. In both low and high energy cure applications, acrylates modified with thiols, amines or ethers and products with highly reactive structures can be used to mitigate oxygen inhibition and increase surface reactivity. The surface reactivity increases with the concentration of the modified acrylate. Synergistic effects are seen by combining thiols with polyethers or highly reactive structures. Increasing the functionality or thickness of the coating also improves surface reactivity. Decreasing the distance from the low energy lamp to the substrate aids surface cure. 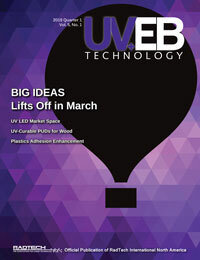 UV Coatings: Basics, Recent Developments and New Applications, pp179-184. Reinhold Schwalm. Elsevier 2007. “UV Curable Aqueous Dispersions for Wood Coatings” Z. Jeffrey Wang, et al. Proceedings, RadTech 1996. Radiation Curing in Polymer Science and Technology, Volume III, pp 33-64. J.P. Fouassier and J.F. Rabek. Elsevier Science Publishers LTD 1993. “Impact of Oxygen on Photopolymerization Kinetics and Polymer Structure” Allison O’Brien and Christopher Bowman. Macromolecules, 2006, 39, 2501-2506. “Formulating for Reactivity,” Kurt Willard. Proceedings, RadTech e/5, 2006. The experimental work on thiols was carried out and reported on by my colleagues: Dr. Steven Cappelle, Dr. Xavier Deruyttere, David Martel, Dr. Stefan Smeets and Stijn Vrijsen. Dr. Jo Ann Arceneaux is the manager of technical service and business development for the Radcure business unit of Allnex USA Inc. Previously, she was the global technical manager of new business development for Cytec Industries Inc., the manager of the Graphics Technical Service & Development Lab for Radcure in the Americas and the manager of research for Radcure Technologies at Surface Specialties UCB. In total, Arceneaux has 29 years of experience in the radiation curing industry, and she has made numerous presentations at RadTech, NPIRI, FSCT and other professional conferences. Contact Jo Ann Arceneaux at joann.arceneaux@allnex.com.